MTY Food Group plummeted as much as 10% Thursday after announcing its takeover of Papa Murphy's. This is a bizarre deal, MTY Food is almost certainly overpaying. The market reacted by dumping MTY Food stock. Why Papa Murphy's is such a struggling brand and the challenges MTY will face operating it. For MTY Food stockowners, the company's M&A strategy may finally have run out of juice. MTY Food Group (OTC:MTYFF) (MTY.TO) is one of the greatest restaurant stock stories of the past 15 years. Though, unless you are Canadian, there's a good chance you've never heard of the firm. Stanley Ma, a Hong Kong-born immigrant, took over MTY Foods in 2003 and transformed it into one of Canada's largest fast food empires. From a market cap of just $5 million in 2003, shares levitated, hitting 100-bagger status by 2013. Recently, the market cap has topped $1 billion, making investors from the ground floor have a 200x return on their hands. As with all compounding stories, however, it's worth asking if these sorts of astronomical returns can go on forever. On Thursday, MTY Foods announced an utterly baffling deal to acquire struggling American take-and-bake pizza chain Papa Murphy's (FRSH). MTY Food group stock is down 10% as of this writing, taking more than $100 million off their market cap for a deal which is only valued at $190 million. Thus, the market's first reaction to this deal is very negative, and as I'll show you in a minute, with good reason. Papa Murphy's: What Is MTY Getting? Papa Murphy's offers “take-and-bake” pizzas and is reportedly the country's fourth largest pizza chain. Unlike the larger firms, Papa Murphy's does not bake its pizzas. It instead sells raw, and customers bake them in their own ovens. The company currently has a store base of around 1,350 domestic units and a handful of international locations. Its stores are primarily on the West Coast and in the Rocky Mountains. It is heavily franchised, with the company operating just over a hundred stores, or roughly 8% of the total store count. Lee Equity purchased the firm in 2010, paying $180 million, or roughly 9x EBITDA for the business. Lee loaded up the company with debt to pursue aggressive growth and pay out dividends. In May 2014, the company IPOed. Shares originally came out at $11. After a brief run above the $20 mark, the wheels came off for Papa Murphy's. Its same-store sales growth rates went into steep decline and new store openings slowed dramatically. On top of that, the company was hit with a series of lawsuits from many of its franchise operators claiming the company misled them about prospects for the business. Given its franchisee problems, over time, Papa Murphy's corporate took on a ton of floundering stores, going from a 96% franchisee rate in 2012 down to 89% in 2016. This business pivot didn't work, and now the company has started aggressively dumping the company-run stores. It has invested heavily in a variety of failed ideas, such as national marketing and an online ordering app. Same-store sales started to plummet, hitting nearly -10% at one point and dropping for a stunning 37 straight months during a stretch of 2016-18. 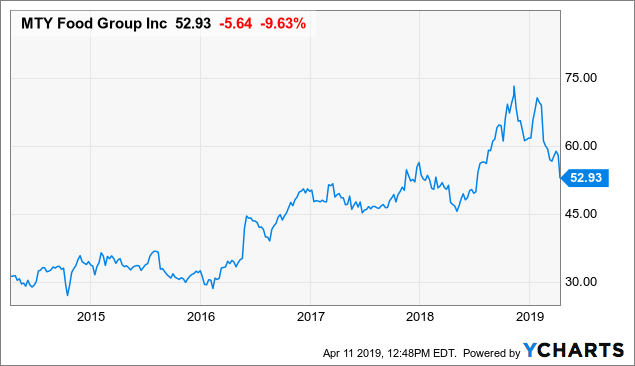 Despite worsening business prospects, FRSH stock held steady at the $5-$6 level for several years and appeared to be setting up a nice short sale opportunity until MTY came along and bought Papa Murphy's out. Is Take And Bake A Viable Business Model? Papa Murphy's has been in business in its present form since 1995. So the company has demonstrated staying power with its take and bake pizza model. However, I'd argue that this is not a concept that can or will scale nationally and whose best days are behind it. Notably, Papa Murphy's present corporate form began with the merger of two Pacific Northwestern take and bake pizza chains. It appears that the company had success in its core markets such as Oregon and Washington because it offered a higher-quality product than most other chain pizza places. Papa Murphy's prides itself on better ingredients, and that culture was a good fit for that market. Papa Murphy's expansions have fared best in states like Colorado and California that are most health-conscious and value the better ingredients marketing angle. However, even if this model worked well in the past in certain markets, its best days are gone. That's in large part due to changes in the food and grocery landscape. You have national grocery chains like Whole Foods that now offer ready-made pizzas with healthy ingredients. Even the likes of Walmart (NYSE:WMT) compete here with their Marketside pizzas. Papa Murphy's isn't competing against just bargain basement mystery meat frozen pizzas at the grocery store anymore. This is bad news for Papa Murphy, as it comes with a structural disadvantage. It generally has store locations in higher-traffic areas such as shopping centers where it or its franchisees have to pay sizable rent. This is in competition with the grocery store chains which have corporate-run kitchens who have much more modest overhead. It's also surely much more inefficient to have employees assembling a few pizzas at each store location individually rather than making them in bulk at one location and then shipping to stores, as Walmart and other chains can do. When Papa Murphy's had little competition, this disadvantage wasn't a huge problem; in 2019, it certainly is. There are other inefficiencies with the model. For one, since customers don't eat at the store, it greatly limits the ability to sell beverages and other high-margin additions to meals. Some bulls on the stock have suggested that Papa Murphy's should start baking pizzas in restaurants as well as selling them ready-to-bake. This would cause several problems. For one, already struggling franchisees would have to outlay a lot more capital to refurbish operations. Even more importantly, Papa Murphy's would lose the ability to accept Electronic Benefit Transfers “EBTs” - sometimes called food stamps which make up a significant portion of the company's business. Unheated foods are considered grocery items, but baking in store would make them a restaurant, thus losing access to this loophole. Papa Murphy's has tried some of the moves that other restaurant chains are making to revitalize the brand. It spent heavily on an app, for example. The app failed to gain traction for what should seem like an obvious reason. Why would you build your pizza on an app when you still have to drive to the store to pick it up? Papa Murphy's eventually threw in the towel on its app, taking a $9 million writedown in 2017. It has now outsourced its digital strategy to a third party. Given that adjusted EBITDA is just $20 million a year here, that was a rather major hit from a rather silly idea. It's now trying other concepts to try to get same-store sales going again, such as home delivery. It is doing this through third-party applications rather than its own service. Once again, it's quite unclear what the value proposition for this will be to consumers. If you want ready-to-bake pizzas, you can already order them from Wal-Mart, Amazon, and other such grocers with robust delivery. And otherwise, most people will probably stick to getting already baked pizzas. I do think that Papa Murphy's could continue to work as a much smaller company that stuck to its core markets. Perhaps MTY Food will shrink the store base to a more manageable group of stronger locations. Regardless, going forward, it's hard to see why there would be further growth in Papa Murphy's concept as it has increasing challenges from both grocery stores in take-and-bake and a horde of new better pizza concepts like Blaze and Mod Pizza. I'm also skeptical that the next generation of consumers is as keen on using and cleaning their oven for take-and-bake pizzas. Especially when there's such a wider variety of high-quality delivery food now than there was a decade ago. As I've said repeatedly about the struggling mall operators, if these are the numbers you report when the economy is really strong, what happens when the next recession hits? 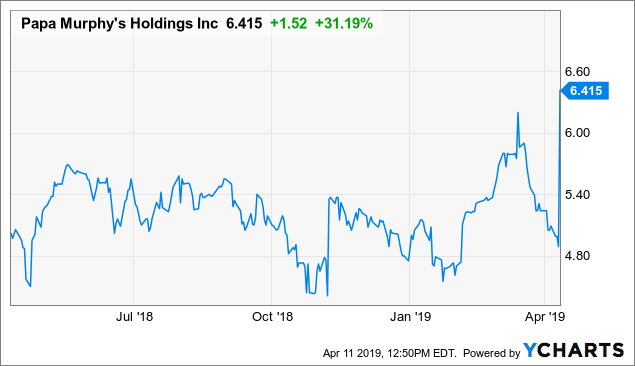 Unlike the mall operators, however, FRSH stock has been essentially flat – trading at $5 plus or minus 20% - since late 2016. It's rather remarkable how badly this business is performing compared to its stock chart. In particular, 2017 saw stacked same-store sales hit -9.8% for Q3. Against that absolutely miserable comp, things keep getting worse yet. All three months for Q3 were down more in 2018. Franchisees were suing the company in droves back in 2014 relating to the company's poor operating performance – how do you think they feel after three straight years of falling sales? Regardless, even if we assume management's optimism (they say things are going well heading into 2019) is actually right for once, the equity here was seemingly grossly overpriced even before MTY stepped in. That's because the balance sheet here was terrible. As of the most recent reported quarter, the company has just $10 million in current assets against $80 million in long-term debt. For comparison's sake, it earned just $4.3 million in full-year 2018. That was a rather big debt load, hence why Papa Murphy's was likely so keen on finding an acquirer. In the past, MTY Food was capable at buying up small restaurant brands and turning them into bigger operations. Between 2003 and 2013, the firm acquired 19 such brands. Along with creating some new brands of their own, this allowed MTY Food to become the so-called king of the food court, having a brand in each food segment to roll out across Canada's malls and shopping centers. However, it's a huge difference buying tiny brands and trying to enhance them versus paying top dollar price for a struggling franchise like Papa Murphy's. Remember that Lee bought Papa Murphy's for roughly 9x EBITDA back in 2010. Since then, EBITDA has actually declined, as the company has seen sales plummet and its store base shrink. And yet, MTY Food is paying nearly the same purchase price - and a significantly higher EBITDA multiple, to buy up Papa Murphy's now. Now, there's no question that Stanley Ma is a better operator than the management team he will be replacing. Perhaps he can turn things around for Papa Murphy's. But this is an expensive transaction, especially counting all the debt MTY has to assume, for a business that is shrinking, losing store units, and may be functionally obsolete in a world where high-quality delivery and take and bake competitors increasingly dominate. If you've owned MTY Food as a long-term compounding buy and hold stock, Thursday's sharp decline should make you reconsider your position in the stock. If you enjoyed this, consider joining Ian's Insider Corner to enjoy access to similar initiation reports for all the new stocks that we buy. Membership also includes an active chat room, weekly updates, and my responses to your questions.